bDepartment of Neurosurgery (M.A. ), School of Medicine, Rasoul-e-Akram Hospital, Iran University of Medical Sciences, Tehran, Iran. SUMMARY: Iatrogenic and traumatic cerebral internal carotid artery injuries are uncommon but potentially lethal complications. Direct surgical repair of ICA injuries may be difficult in an acute setting. However, endovascular treatment with a flow-diverter embolization device is a feasible alternative technique that we experienced. In this clinical report, we describe demographic data, radiographic images, lesion characteristics, endovascular procedure notes, postprocedural hospital course, and follow-up digital subtraction angiography of 5 patients. At least 6-month follow-up was available in all patients without occurrence of rebleeding and other complications. Iatrogenic and traumatic cerebral internal carotid artery injuries are uncommon but potentially lethal complications. Immediate diagnosis and management of these injuries may be lifesaving. 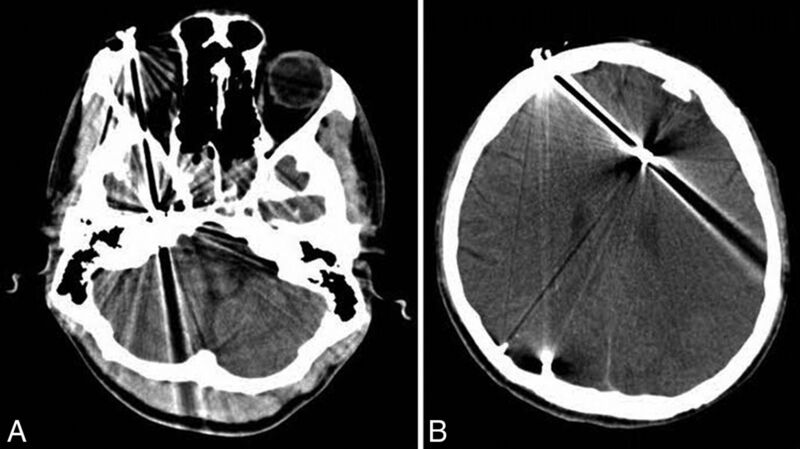 The iatrogenic vascular injuries were categorized according to each diagnostic or therapeutic procedure responsible for the injury such as transsphenoidal surgery, functional endoscopic sinus surgery (FESS), skull base surgery, tumor surgery, central venous catheterization, and the others.1 Traumatic vascular injuries can occur due to any penetrating or blunt trauma to the craniocervical region during gunshot, impulsion, and road traffic injuries. Traditionally, surgical ligation or endovascular occlusion of the ICA has been used to treat ICA injuries; however, surgical ligation is associated with a high incidence of major complications.4 Lately, stent grafts have become a more usable option for the treatment of ICA injuries. Their complications are rare but include dissection, distal embolus, perforation, and occlusion. The low flexibility of stent-graft devices is another problem of deployment in vascular bends and curvature. The Surpass Streamline flow-diverter device (FDD) (Stryker Neurovascular, Fremont, California) is part of a new generation of endoluminal devices for treating large or giant wide-neck aneurysms. The stent is a self-expanding tubular mesh made of cobalt-chromium with 30% metal coverage. In a series published by De Vries et al,5 the investigators used Surpass to treat 37 patients, with an occlusion rate of 94% at nonbifurcation sites and 50% at bifurcation locations. One patient had a stroke following treatment, and no mortality was reported. In this article, we present our experience with the management of iatrogenic and traumatic ICA injuries and their outcomes after endovascular treatment with Surpass Streamline FDD placement. A retrospective study was conducted, and all patients with an ICA injury related to iatrogenic or traumatic causes who underwent endovascular treatment with the Surpass Streamline FDD in our institution (Firoozgar Hospital) were included from 2015 to 2017. Patient demographic data, clinical charts, indications for treatment, radiographic images, lesion characteristics, operative notes, endovascular procedural notes, postprocedural hospital course, and follow-up DSAs were reviewed. The etiologies of the ICA injuries were as follows: transsphenoidal surgery (n = 2), FESS (n = 1), car collision (n = 1), and gunshot (n = 1). Patient information, mechanism of injury, angiographic findings, treatment, and outcome are summarized in the Table. Informed consent was obtained from the patients or legal representative for the use of the Surpass Streamline FDD, including its off-label use. All procedures were performed with the patient under general anesthesia and in the angiographic suite. In iatrogenic ICA injuries, the operative site was packed before transfer to the angiographic suite to maintain homeostasis. First, through a right-sided femoral access, selective DSA identified or confirmed the site of extravasations and ICA injuries. In 2 patients, the area of extravasation was the cavernous segment, and in 3 patients, it was the paraclival segment of the ICA. For endovascular treatment, the existing sheath was exchanged for a 90-cm-long sheath with a 260-cm guiding wire, and then a 6F Envoy (Codman & Shurtleff, Raynham, Massachusetts) guiding catheter was introduced to the right or left ICA by a 0.035-inch hydrophilic guiding wire. The Surpass embolization device was passed over a 0.014-inch microwire and was placed across the extravasated area. Devices were deployed slowly and precisely without complications, and control DSA revealed good position of devices. After FDD positioning and just before deployment, heparin was administered with an initial IV bolus of 60–70 IU/kg (maximum, 5000 U), followed by an IV infusion of 12–15 IU/kg/h (maximum, 1000 U/h). Then the FDD was deployed, and it covered the site of injury. After deployment, all patients received 650 mg (2 × 325 mg) of aspirin and 600 mg (4 × 75 mg) of clopidogrel as loading doses through an orogastric tube and continued with 75 mg of clopidogrel and 325 mg of aspirin daily. Systemic heparin infusion was maintained for 48 hours. Dual-antiplatelet therapy (aspirin, 325 mg, and clopidogrel, 75 mg daily) was continued for 6 months in all patients. At follow-up visits, neurologic examinations were performed, and follow-up DSA was performed for all patients after 6 months and confirmed the patency of the stents. On the third day after discontinuation of heparin, the nasal tampon was removed in the operating room by an endoscope with the patient under general anesthesia. A 21-year-old man was shot and admitted to another hospital about 20 days prior. He underwent an operation to treat intracerebral hemorrhage and then was referred to our institution for more diagnostic and therapeutic interventions. His Glasgow Coma Scale score at this time was 15. His blood pressure and heart rate were stable. On neurologic examination, he had hemiparesis of the left-sided limbs. Noncontrast head CT revealed multiple shots in the cranial and cervical regions (Fig 1). Selective DSA revealed a vascular injury and dissecting aneurysm due to the gun injury in the paraclival segment of right ICA (Fig 2). Axial spiral brain CT scans. Lateral view of right ICA selective angiography. At this time, we decided to manage this injury with an endovascular technique. With the patient under general anesthesia, a Surpass Streamline FDD (4.0 × 20 mm) was deployed covering the site of injury, with heparin and dual-antiplatelet administration as mentioned before. Follow-up DSA was performed after 6 months and confirmed the patency of the stent with complete recovery of the dissecting aneurysm (Fig 3). Posttreatment DSA. A, Lateral view of the right ICA, B, Anteroposterior view of the right ICA. A 40-year-old female patient had massive arterial bleeding during an endoscopic transsphenoidal operation to treat clival chondrosarcoma. The site was packed and the patient was transferred to the angiographic suite under general anesthesia. Selective DSA via right femoral access showed a small iatrogenic injury at the medial wall of the paraclival segment of the left ICA with pseudoaneurysm formation (Fig 4A). A Surpass Streamline FDD (4.0 × 20 mm) was deployed covering the site of injury, with heparin and dual-antiplatelet administration as mentioned before. Follow-up DSA was performed after 6 months, confirming the patency of the stent with complete recovery of the injury (Fig 4B). A, Anteroposterior view of left ICA selective angiography. B, Posttreatment anteroposterior view of left ICA angiography. A 52-year-old man underwent functional endoscopic sinus surgery for a nasal polyp at another hospital and then was referred to our institution with massive epistaxis occurring after 2 days. Selective DSA detected an iatrogenic left ICA laceration at the cavernous segment (Fig 5). A Surpass Streamline FDD (4.0 × 20 mm) was deployed covering the site of injury, with heparin and dual-antiplatelet administration as mentioned before. After 6 months, follow-up DSA was performed and revealed patency of the stent with complete recovery of the injury (Fig 6). A, Lateral view of left ICA selective angiography. B, Oblique view of left ICA angiography. Posttreatment DSA. A, Lateral view of the left ICA. B, Anteroposterior view of the left ICA. A 20-year-old man with a history of a car collision about 1 month before was admitted to another hospital with intermittent epistaxis; an endoscopic nasal examination was performed in the operating room. Then, the patient was referred to our institution with suspicion of an ICA injury. Selective DSA revealed a traumatic pseudoaneurysm formation at the cavernous segment of the left ICA (Fig 7A). Treatment with a Surpass Streamline FDD (4.0 × 30 mm) deployment and heparin and dual-antiplatelet administration was performed successfully. After 6 months, follow-up DSA showed a good position of the device without any other complications (Fig 7B). A, Lateral view of left ICA angiography during catheterization. B, Posttreatment DSA of the left ICA. A 39-year-old woman with a pituitary lesion suspicious for craniopharyngioma was admitted to our hospital for an operation. During endoscopic transsphenoidal surgery, massive arterial bleeding occurred and was packed, and the patient was transferred immediately to the angiographic suite under general anesthesia. Selective DSA showed a small iatrogenic injury at the paraclival segment of the left ICA with carotid cavernous fistula formation on the same side (Fig 8A). A Surpass Streamline FDD (4.0 × 20 mm) was deployed covering the site of injury, with heparin and dual-antiplatelet administration as mentioned before. After 6 months, follow-up DSA was performed and revealed patency of the stent with complete recovery of the injury (Fig 8B). A, Lateral view of left ICA selective angiography. B, Posttreatment lateral view of left ICA angiography. In 2018, Aydin et al1 studied 21 patients who underwent endovascular embolization for iatrogenic vascular injury in the craniocervical region and concluded that endovascular management of such cases was a good option, with low mortality and morbidity rates. Endovascular management of these vascular injuries included parent artery occlusion (n = 15), aneurysm occlusion (n = 3), covered stent (n = 1), and conservative management (n = 2).1 Kocer et al8 revealed the possibility of using an endovascular stent graft for the treatment of iatrogenic ICA lacerations. In their cases, the use of stent grafts proved expedient, safe, and effective in the emergency treatment of a massive hemorrhage resulting from ICA injury that occurred during transsphenoidal surgery. Endovascular treatment with covered stents has, for some time, been successfully used to treat subclavian and axillary arterial injuries.9 Covered stent placement has also been reported as an option for iatrogenic ICA injuries during transsphenoidal surgery in patients who cannot tolerate ICA occlusion.10 Morken et al11 presented a patient with a meningioma who, during transsphenoidal resection, had a laceration of the ICA, which underwent endovascular treatment with a covered stent graft. However, in 1 case, iatrogenic vascular injury at the paraclival segment of the right ICA permitted deployment of a rigid stent graft at that straight segment, but in our opinion, stent graft deployment is not possible in curvilinear segments like the siphon of the ICA due to rigidity of this type of stent. In 2015, Lancu et al12 reported 1 case of iatrogenic ICA injury with a secondary carotid cavernous fistula after transsphenoidal surgery that was treated with a Silk flow-diverter stent (Balt Extrusion, Montmorency, France) placed within the injured internal carotid artery and coils placed within the cavernous sinus. Wakhloo et al13 and Colby et al14 recently showed, in 2 case series, that Surpass is a new-generation flow diverter with unique device-specific and delivery-specific features, compared with clinically available endoluminal flow diverters, and has safety and efficacy in the treatment of intracranial aneurysms comparable with that of stent-assisted coil embolization. Ogilvy et al15 reported 3 patients with direct traumatic carotid cavernous fistulas who were treated with either coils, coils and Onyx (Covidien, Irvine, California), or a detachable balloon followed by placement of a flow-diverting stent for endoluminal reconstruction, and all 3 patients recovered clinically. They concluded that a flow diverter may facilitate endothelialization of the injury to the internal carotid artery. All our patients had small carotid defects due to iatrogenic or traumatic injury. None of them could tolerate angiographically or clinically the balloon occlusion test, and patency of the ICA was important. Multiple series of treatment of intracranial blister aneurysms by FDDs had high success and low complication rates in other centers.18⇓–20 We also had a successful experience with 18 patients with blister aneurysms treated by a different type of FDD. Small iatrogenic and traumatic defects of the wall of the ICA are comparable with blister aneurysms pathologically. Therefore, we considered the same strategy for our patients because there was no other proved safe treatment technique. The Surpass Streamline FDD has been available since 2015 in our center and was chosen due to its higher mesh density, greater stability during deployment, and faster positioning in curved and nontortuous anatomy compared with other FDDs. FDDs alone for the treatment of ICA iatrogenic and traumatic small injuries have not been reported before, to our knowledge. Due to the rarity of this complication, there is no other safe treatment, and the total number of patients studied is small, but all of them showed complete resolution of complications and good outcomes, which can be a basis for future studies. Accepted after revision January 31, 2018.